Regardless of specific position, Diocletian rose to power through interesting circumstances. During a war with the Persians, Numerian was killed and Diocletian was made Emperor by the troops of the Roman Army. The man who supposedly killed the Emperor went by the name of Aper, which means "boar". This was significant for Diocletian because as a young soldier a prophesy was made that he would be made emperor after he had killed a boar. Thus, Diocletian felt this vision legitimated his rule as Emperor. 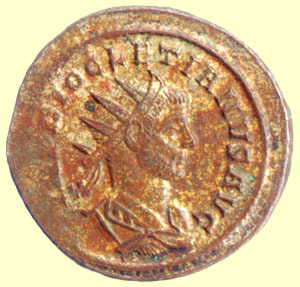 Though Numerian was dead, Carinus still stood in Diocletian's way of becoming Emperor. However, Carinus's own troops turned on him and killed him. Thus, in 285 AD, Diocletian became the sole Emperor of Rome. When Diocletian became ruler, the empire had been the product of many years of chaos and instability. Diocletian sought to change this. Through political restructuring and reform, he began to re-establish partial balance and peace in the Empire. bDiocletian, Roman Emperor A.D. 284-305.
dDiocletian the Builder, and the Decline of Agriculture.